Delicate and small hair pins can make a powerful statement. You don’t need to go overboard with grande, oversized wedding accessories. Nor should you wear a piece that doesn’t feel like you or distracts attention away from the rest of your bridal look. We love to recommend our smaller bridal hair pins for our brides who want versatility with styling or where their look bridal feel more minimalist. smaller is often more appropriate. After all, we definitely believe that less is often more. A delicate piece will always feel more timeless than something heavy or chunky. If you’re still deciding on the best hairstyle for your wedding day, or you’d like to change your look after the ceremony, something smaller is a great option. A set of small hair pins, like our MEADOW or WHISPER hair pin set, because it can be reworked easily into a different hairstyle by simply rearranging them into a row or scattering them. Feminine and whimsical, the WHISPER blush or ivory floral hair pins are enchanting and full of exquisite details. The flowers in various stages of bloom were inspired by the beauty of wild flowers and the carefree styling of freshly picked flowers woven into loose hair. These precious handcrafted flowers are available in soft blush or ivory tones and are perfect to scatter across a romantic updo or half up hairstyle. Pair these delicate hair flowers with the GEORGE, ISABEAU or ARLETTE crystal drop earrings. The TEAROSE blush wedding hair pin features pale rose and peachy tones that adds the perfect touch of warmth to a romantic bridal look. Perfect for romantic tendrils nonchalanty escaping from a soft bridal bun, the TEAROSE hair pin feels beautifully fragile yet classically elegant. Also available in other colour combinations – silver/ivory, gold/ivory or gold/blush tones. This delicate hair pin is perfectly paired with the MIDSUMMER, ALLURA and NIGHTINGALE wedding earrings. The MEADOW floral hair pins were designed to scatter into romantic and loose hairstyles to evoke a mood that’s equal parts relaxed and ethereal. Each piece has been designed to be intentionally mismatched for an organic and whimsical feel. Style these hair pins neatly in a row or spread them along your romantic half up hairstyle for a look that’s carefree and high style. Although it may be small, it is mighty. It brings together the essence of our Secret Garden collection in a way that’s understated and relaxed, and still bursting with old world regality. Match the ivory and silver tones to delicate earring such as the TULIP, NIGHTINGALE and FREEFALL pearl drop sets. An enticing and whimsical take on traditional hair pins. The set of 3 BRIAR-ROSE bridal hair pins are small and dainty, yet their exquisite detailing offers the perfect just picked from the garden look. These classic and pretty pieces are a sweet serendipity of shimmering pearls, clear crystals and life-like flower buds. You’ll be proud to wear them again after the wedding day to anniversaries and dinners with your beloved. Inspired by the beauty of a wild and overgrown garden, the MARQUISE bridal comb is majestic yet strikingly simple. It evokes a sense of magic and serendipity, the perfect piece to achieve a polished, paired back aesthetic. The MARQUISE comb is a perfect match with the TULIP, BELOVED and NIGHTINGALE wedding earrings. Echoing nature’s handiwork, the COCO blush floral hair pins are the perfect floral accents when a subtle feminine touch is all you need to adorn romantic and tousled hair. With flower details handcrafted from clay and finished with Swarovski crystal details, this set of two bridal hair pins are sure to delight. If you’ve fallen in love with a set of 2 hair pins, but would prefer a set of 3, have no fear. Please get in touch with us and we would love to work with you to create a custom set with the additional pin. Let us know your vision and thoughts, and we’ll get back to you with timeframe and cost details. 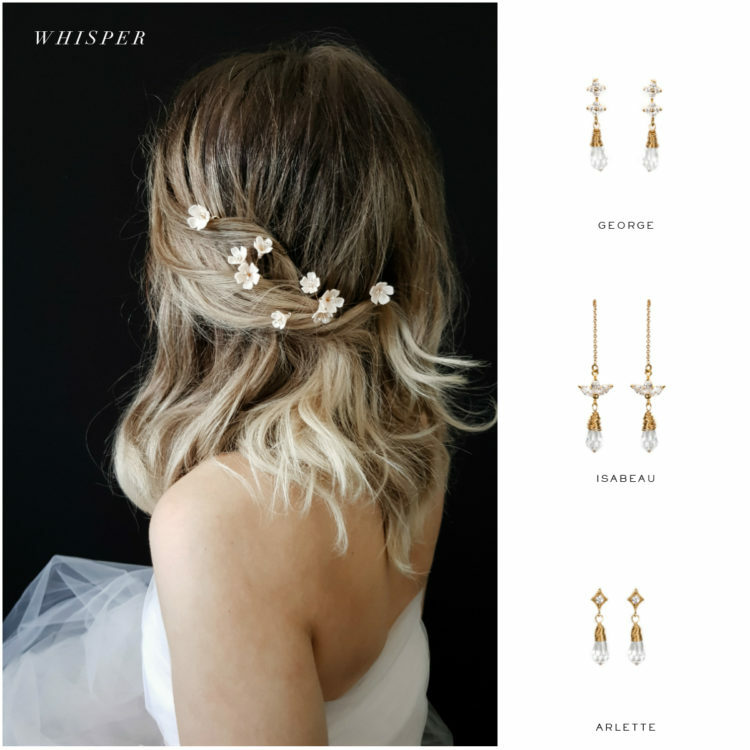 We work with a lot of brides who love our WHISPER hair pins (set of 5) but opt for a set of 8-10 so they can create a fuller floral look in their hair. We’d love to hear from you if you have any questions about our smaller delicate hair pieces, or if you’d like an existing longer style slightly scaled down to a smaller size.